I have the Bootstrap 4 (Oldgregg) theme. 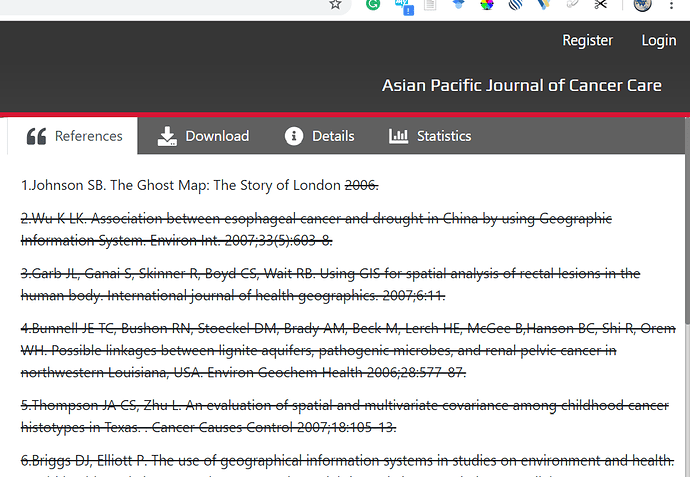 In One of the article when I publish while the abstract does not appear, all the texts that appear in the left column (PDF, References, Details) are strike-through text as you can see in following images?. I have no idea. Maybe from custom CSS. Can you send me a link to the problematic article in the private message? @rmosavi, I see that the page isn’t fully loaded. Do you have an access to the PHP error log? It should contain something regarding this issue, relevant are errors and fatal errors that occur just after you trying access this page. Thank you I will look at and let you know. Interestingly, this does not happen when I change the theme to other themes such as Health and default. I was unable to get the error log as it does not generate any error. I tested with BOOTStrap 3 theme, it still give the same problem. What else should I look for to resolve it? Meanwhile, the articles which have only pdf galley can be accessed. and tell if this solves the problem. Can you look to or ask someone to look into the PHP logs just after accessing problematic page? It’s hard to say something about the problem without logs. The reason behind this error is that sometime ago JATS Parser plugin was installed to the system. This plugin has conflicts with the same classes inside Old Gregg theme and I’m trying to avoid them. In you case this check empty($jatsParserSettings) gives false and Old Gregg theme fails to load. This happens if JATS Parser plugin was deleted from the system without prior deactivation. I’m getting redirects to the search page from those links. Are you sure that those articles are published and have a free access? You are right the articles were not published. Now the articles are visible even when I am not logged in. Hmm, that’s looks like incompatibility with PHP version. As I remember, those declaration types are started to be supported from v 7.1. Can you check what PHP version your OJS instance is using? OJS is fully compatible with PHP 7+. Did you try to change mysql driver to mysqli in config.inc.php when changing PHP version? We missed this when changing to php 7+. It works now with php 7.1 and https://jurnalbeta.ac.id/index.php/betaJTM/article/view/109 is normal . The error means that one of the authors listed in the references of JATS XML doesn’t have given-names field filled in. I have checked the xml file properly, the given names for the authors were filled. I tried the xml in another web https://dryam.website/index.php/jer/article/view/6/5, it works.